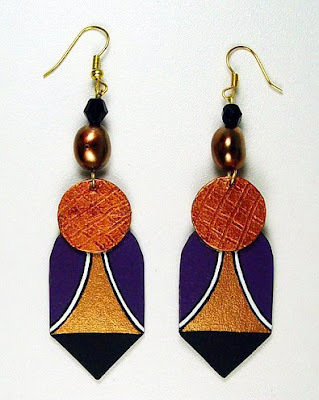 If big and bold jewelry is your style, you just might love these papier mache necklaces and earrings, created by Evangeline Duplessis of Cape Town, South Africa. Her designs have been exhibited in galleries and featured in magazines. Molding wet paper strips into something useful has long been a passion of Evangeline's. She made toys as a child, and the Christmas tree was never completely dressed without some of the family's own handmade papier mache decorations. 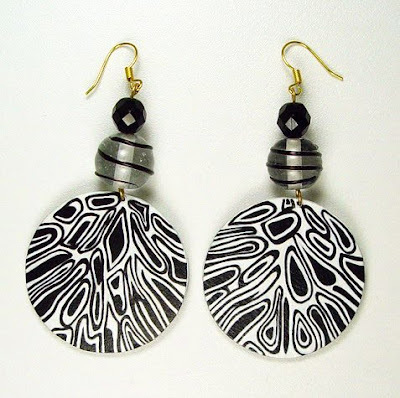 As an adult, Evangeline became a transparency retouching artist (an art now done by computers) and it was while working in Zurich, Switzerland that she renewed her interest in papier mache and developed a passion for jewelry making. Through research and experimentation, Evangeline refined her technique and began creating beads. She finds working on a small scale most satisfying, and jokes that retouching artists don't fade away... they paint beads! 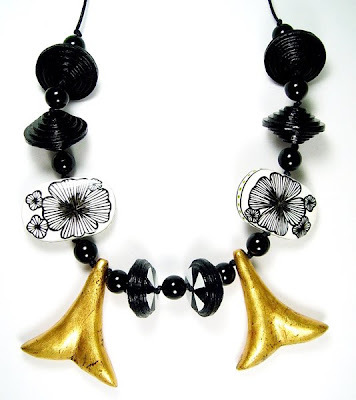 She incorporates precious and semi-precious stones, and silver and gold leaf in her rich designs... along with a bit of her quirky sense of humor. Take a look at this Ants in Your Pants necklace, all dressed up with gold leaf and faceted beads. 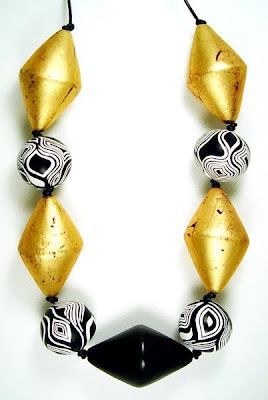 Each bead is carefully crafted by hand, then hand-painted or gilded, and finally sealed. Because the material is light, yet very strong, it lends itself to chunky pieces that are surprisingly comfortable to wear. Visit Papier Mache Gallery or Evangeline's Facebook page to see more of her designs. Oh, the joys of paper!! 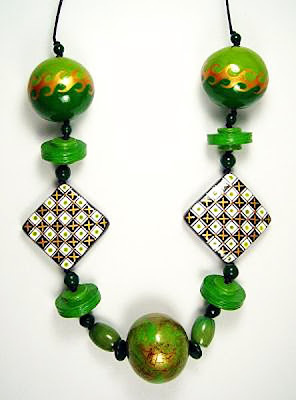 I love Evangeline's jewellery pieces, the colours and shapes are gorgeous. I love the Ants in your pants neckpiece!! Thanks Ann for showcasing Evangeline's jewellery. How beautiful and colourful. She says she recycles waste paper to make these wonderful paper jewels. Truly amazing. They are Awsome, thanks for sharing!!!! Evangeline's work is simply GORGEOUS! I like to look at big bold jewelry but not wear it :) I Think her work is very cool. I always know I'll be wowed when I visit your blog! Evangeline's work is exquisite with that exotic touch. Thanks so much for featuring her! Oh my! 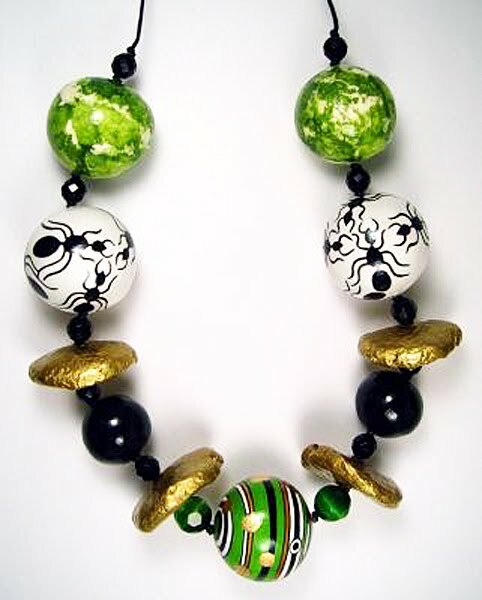 I absolutely love that bottom green and gold bead in that necklace. Oh that's nice to hear, Dani! Evanglines creativity and intense attention to detail takes my breathe away. Thank you for sharing!